What a crazy couple of weeks I've had. The day I returned from the retreat, I began preparing the house for a baby shower which meant unpacking and attempting to bring some semblance of order to my front yard (aka, the mud pit) while the city repaved the street and installed new driveway approaches, curbs, and sidewalks. The shower was Saturday and I think it went off wonderfully and the new street is open and so smooth! The house still isn't finished, but I thought I'd take a few photos while it was cleaned up for the shower. It's open to the living room, which I initially didn't think I would like, but now I think I love. My sewing room is functional and I started on a new baby girl quilt. I wish I had more free time to spend in here. I love being surrounded by all the color. But, I've got a huge stack of new work projects (the kind I actually get paid for which means they take precedence over the fun ones) and a commissioned knitting project (a fair isle Christmas stocking) to work on this week. At least my house is all cleaned up for Thursday. The family is coming to my house for Thanksgiving! Who else is having Thanksgiving at their house? Your kitchen is to die for! LOVE IT! OMG, I want to live in your kitchen!!! Enjoy it! 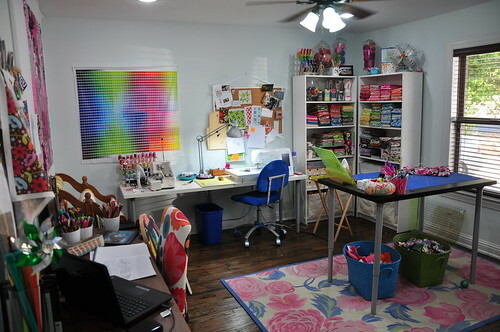 Love the bright colours in your workroom too. Your house is looking so pretty! I love, love, love the kitchen. And your sewing room...FABULOUS! I want your kitchen! It turned out fantastic! And your workroom is to die for as well. I too recognize the quilt pattern. Your fabric choices play up the pattern so well! Beautiful Kitchen and what I really love is the turquoise island. Your kitchen is gorgeous! That's the setup I want -- opening into the den. That way you know where the kid is! 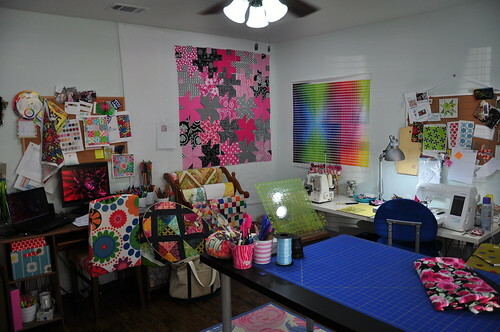 Your sewing room is pretty frickin fabulous too! Congrats! What a beautiful house. And your sewing space is fantastic! Good to see things are all coming together. Happy Thanksgiving! Your kitchen is beautiful and your sewing room is awesome! Love, love, love your new house! Soooo beautiful and congratulations!!! Your turquoise island is amazing! So is your sewing room. Having Thanksgiving at our son and daughter-in-law, invited three international students who have nowhere to go. I love, love, love your kitchen! I wish I could back up a big truck and take it home with me. Hey, I have a cordless drill; I could do it. But it wouldn't look as wonderful as it does next to your living room. Where did you get your island? Melanie, your house looks gorgeous. It looks like it is out of a magazine. And I love your sewing space. Love it! the house looks beautiful!! you´ve done a great job there..
Congrats on getting settled in. Lots of great things to look at in the beautiful new house! Thanksgiving was at our house, which is the usual for the past 6-8 years. We fed 17 today and have tons of leftovers to enjoy. Hope yours was happy too. I love your kitchen and how it is open to the family area with the fireplace! Sewing room is beautiful! hi, your house looks fantastic!! 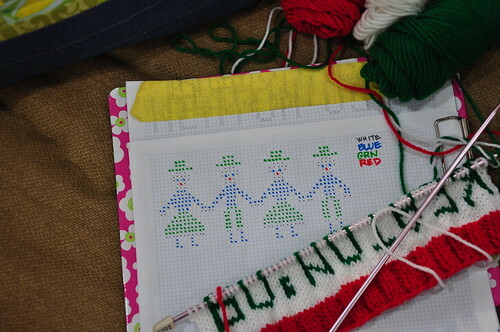 I was wondering what the pattern of the quilt you are making is? it looks so beautiful!! Your kitchen is amazing...and your sewing studio to die for. I can see why you want to be in here more! Oh Melanie, it's gorgeous! Congratulations!! You've done a beautiful job!! 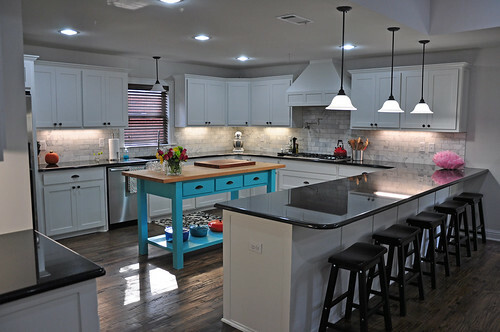 That pop of turquoise in the kitchen is just PERFECT! Love it! Merry Christmas! Wow! I love your studio. It's absolutely beautiful! I love your kitchen/living area! 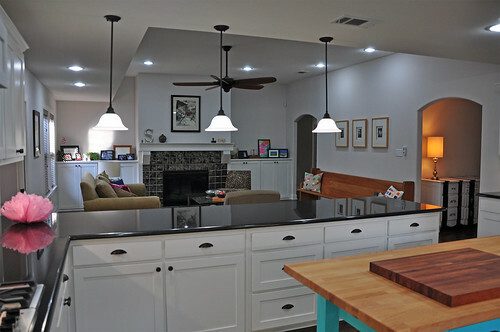 Love the island in your kitchen! !